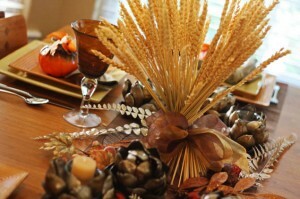 Our friends at celebrations.com have created a thanksgiving feast to impress even the stuffiest of guests. Using our Elegant Gratitude Thanksgiving invitation as their inspiration, the decorations, table settings and menu incorporate simple, natural elements with a modern twist of elegance. Using a centerpiece of wheat stalks (find out how to make it yourself at celebrations.com) they anchored the display in a bed of leaf sprigs that echoed the invitation, supplementing the display with nuts, pumpkins, artichokes and acorns. Metallic coatings on the leaves add a touch of modern elegance. Chairs at the table were draped with tea towels featuring an ivory and brown artichoke pattern and tied with an organza ribbon. Place settings of yellow and orange plates were topped with pumpkins serving as place cards. 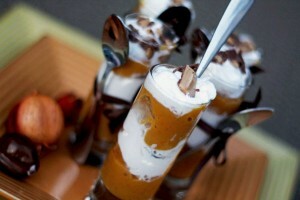 The menu was kept to traditional favorites, but ended with a surprise: pumpkin parfaits instead of pie. Spiced nuts, also used in the salad, were sent home with the guests in decorated jars. Finally, to help stimulate conversation at the table, a basket of conversation starters was passed around. Pear Tree Greetings’ Thanksgiving mini note cards, pre-personalized with the words “I am thankful for…” are a perfect way to get the conversation going. 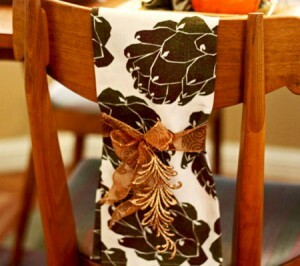 For more Thanksgiving ideas, keep reading our blog. 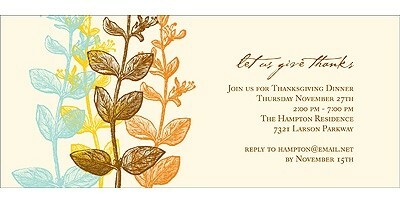 Or shop our collection of Thanksgiving invitations to get started planning your own feast. What a simple and very elegant Thanksgiving dinner. I like the tea towels over the chair backs and sending guests home with spiced nuts that were used in the salad. We like to go around the table with everyone talking about what they are thankful for but I like the “I am thankful for” novelettes to get the conversation and ideas going. Thank you! So glad you liked the party and inspiration in this post! The notelettes definitely do help get the conversation and ideas started at the dinner table.